The on-going quest to construct a scientific model of the universe has been an extraordinary saga of observation, engineering, theoretical exploration, and hypothesis testing. It has culminated in the understanding, developed over the past three decades, that the known universe is almost entirely (96%) composed of dark matter and dark energy. The first, dark matter, gravitationally accelerates the formation of cosmic structures. The second, dark energy, pushes these structures apart after they form. Considered together, these two components, little understood and never directly observed, can explain the growth of all cosmic structure and the dynamics that are the key to the universe’s fate. This lecture will explore the history and the physics of our current model of the universe: How did structure in the universe arise, how has it evolved, and what is its ultimate fate? The lecture will emphasize the role of three critical aspects of rational scientific inquiry in arriving at the current cosmological paradigm: The application of direct measurement and observation, the use of rigorous mathematical modeling, and the requirement that hypotheses be testable and verifiable. And, while pointing out how the current paradigm has met critical analysis thus far and “works” to great precision, the lecture will also discuss some fundamental questions about the cosmos that the current model does not answer. JEREMIAH P. OSTRIKER is the Charles A. Young Professor Emeritus of Astrophysical Sciences at Princeton University, a member of the Dept. of Astronomy and Astrophysics at Columbia, and Treasurer of the National Academy of Sciences. Previously he served as Provost of Princeton University. He has carried out seminal research in many areas of theoretical astrophysics and cosmology, including work on gravitational lensing, rotating stars, pulsars, X-ray binaries, the evolution of star systems, such as globular clusters, galaxy formation, the stability of galaxies, active galactic nuclei, astrophysical blast waves, the dynamics of galaxy clusters, and the cosmic web. He was instrumental, with James Gunn and others, in planning, funding, and building the Sloan Digital Sky Survey facility and carrying out the survey. He also played a significant part in the work that led to the discovery that dark matter and dark energy are fundamental constituents of the universe. Currently he is working to better understand the formation and evolution of galaxies and their central black holes. Among many awards, he is the recipient of the Henry Norris Russell Prize of the American Astronomical Society, the Vainu Bappu Memorial Award of the Indian National Science Academy, the Karl Schwarzschild Medal of the German Astronomische Gesellschaft, the Royal Astronomical Society Gold Medal, the National Medal of Science (awarded by President Clinton), and, recently, he was recognized by President Obama as a Champion of Change for his work on the Sloan Digital Sky Survey. Jerry has supervised and collaborated with many young researchers and graduate students. He is an author on more than 500 scientific publications and he is co-author, with Simon Mitton, of Heart of Darkness: Unraveling the Mysteries of the Invisible Universe, intended for general audiences and recently published by Princeton University Press. President Larry Millstein called the 2330th meeting to order on March 7, 2014 at 8:22 pm. He announced the order of business, and talked about the 4th meeting of the Society held in 1871. The topics were a new kind of clock, preservation of food, and reports of travels in Yukon. After the introduction of new members, minutes from the previous lecture were read and approved. The President then introduced the speaker for the evening, Dr. Jeremiah Ostriker. Showing the famous Hubble Telescope picture featuring many galaxies, Dr. Ostriker said he had been described as a "scientific realist" because he believes that these galaxies exist and will still be out there if we foolishly destroy this planet. Dr. Ostriker said that just describing what we know about the universe makes an unbelievable story; interesting and fantastic, but not quite credible. So he tells it as a historical tale. Dr. Ostriker said that he does not believe that science changes by revolutions, but instead by finding out what we knew about something was a small piece of a bigger picture, and repeating this process. He mentioned his book, Heart of Darkness: Unraveling the Mysteries of the Invisible Universe, co-authored with Simon Mitton, which starts from the times of Galileo, moving on to Newton's era, then to the changes in 1920s, the quantitative era going through 1950s and beyond, and our current understanding, finishing with the questions that are still open. Dr. Ostriker is of the opinion that Galileo is great fun to read: Smart, arrogant and witty. The conclusion of Galileo's period was that, contra to our intuition, the sun doesn't go around us, we and the other planets go around the sun. The next era, Newton's era, saw huge developments in physics, mathematics and the concept of universal laws, which we have since established as an empirical fact. Building on Brahe and Kepler's work, Newton developed the inverse square law for the force between the Sun and the planets which accounts for the orbits perfectly. This was tested with Haley's Comet. Observing its orbit, we could predict precisely the time of its next appearance. This test of what Newton had proposed was very important: You can always make up a theory to explain things already seen, but scientific theories need to have the power of prediction. In the 18th century, stars were studied. Through a telescope, stars stay as points; they do not move like planets or go around the Sun. The Sun was tentatively marked as a star, but since it is so much brighter, stars must be far away. So we should see them go back and forth when we move in our orbit, and the distances of some stars were measured based on this. Next, how are the stars distributed? We saw that there is a disk of stars around us, called the Milky Way, seen brighter from the southern hemisphere, and its center visible. Eventually we learned that the Solar System is embedded in this disk of stars. But there were objects called the spiral nebulae, which were not stars. We knew that they were out of the Milky Way, but not what they were. Dr. Ostriker told about the telescope Lord Rosse built in Ireland in the 19th century to observe nebulae. Lord Rosse drew quite reasonable pictures, showing bright centers and spiral structure---the spiral nebulae were revealed to be not clouds of dust, but distant galaxies. Dr. Ostriker next moved to 1920s, with the work of Harlow Shapley, Edwin Hubble, Walter Baade and Albert Einstein. Shapley found out that star distribution in our galaxy is not random: There are more in the southern hemisphere, and they circulate around Sagittarius, where the galactic light is brightest. He speculated that region as the center, putting us in the outskirts. Then the nature of the other galaxies was studied. It was proven that Andromeda, our nearest neighbour, is another galaxy like ours, with its distance and size measured. Einstein developed Special Relativity to make Newtonian Mechanics consistent with Maxwell's Electromagnetism and General Relativity by adding gravity. The simplest picture Einstein knew was that we lived in a static universe. This was a problem: Objects should attract and collapse into each other; with gravity you cannot have a static universe without something to balance it. So Einstein came up with something pushing things apart to balance gravitational pull, and called this "the cosmological constant." Dr. Ostriker pointed out that this had two problems: One is that the astronomical community already knew that the universe wasn't static, it was just that they weren't talking to theoretical physicists. Hubble had measured that the galaxies were moving away with respect to our position, with the furthest away moving the fastest. Second, gravity is an inverse square law and its strength depends on distance. So depending on how close things are, they should either be collapsing together with gravity being stronger, or fly apart, with gravity much weaker. Thus Einstein's model with the cosmological constant was wildly unstable, as Russian mathematician Friedmann showed. Dr. Ostriker next moved to the 1930s and 40s. The question was now "Is gravity weak enough that the universe will expand forever, or strong enough that it will stop expanding and eventually recollapse?" Dr. Ostriker asked the audience to imagine different universes: Take a small piece of the universe, which was smaller in the past. It can keep expanding, or expand and then collapse, or with Einstein's cosmological constant, keep expanding faster. so which is it? Between the 1950s and 1975, which Dr. Ostriker called the heroic era of observation, this was the question. Some studied if the expansion was slowing down. Others tried to measure gravity: Is the amount of mass in the observed universe enough to make it turn around and recollapse? Theoretical physicists calculated how the Big Bang would be reflected in the material composition of the universe: Isotope ratios of light elements created in its conditions. People also started studying galaxy formation and origins of the observed structures. Bob Dicke in Princeton theorized that at a Big Bang, the universe's temperature would have been very high, and while it has expanded and cooled, there should still be some background radiation left over. He built a large antenna to look for it unsuccessfully. Two engineers at Bell Labs, Penzias and Wilson, found it in 1965 when investigating the background noise in a large microwave antenna. They knew a student of Dicke's, James Peebles, who realized this was what Dicke had been looking for. Peebles also supported the Big Bang theory by showing the light element amounts expected from the Big Bang match observation. A student of Peebles, Margaret Geller, conducted galaxy surveys in the 1980s and compiled a 3-D map of the nearby universe. She found large-scale structure in the Universe, with clusters and voids, walls and filaments. Beatrice Tinsley had pointed out that galaxies have to evolve as stars are born and die. So we couldn't use the brightness of galaxies as a yardmark without considering their evolution, and needed to understand what shapes galaxies, as well as Geller's large-scale structures. The only possible candidate is gravity, but it was not strong enough: Dr. Ostriker said that all the observable mass was too small to explain the origin of structure. Could there be stuff we didn't see, in other words, dark matter? All the way back in 1937, Swiss astronomer Fritz Zwicky had proposed the existence of dark matter. Zwicky calculated that the amount of gravity required to hold galaxy clusters together was many times what the visible matter there could exert. In the next forty years, more evidence accumulated. For instance, rotation curves of galaxies show that the cumulative galaxy mass keeps increasing away from the center, but there's nothing visible with that mass. Dr. Ostriker's own work in the 1970s showed this, as well as work done in the 1930s on Andromeda by Horace Babcock. Galaxy halos and gravitational lenses also give evidence for dark matter. Dr. Ostriker said that by 1975 we knew about dark matter and ordinary matter. Since then, we have observed fluctuations in the CMBR which indicate non-uniformity in the initial conditions. But dark matter still was not enough to close the universe or make it flat. In 1991, the COBE satellite measured the whole spectrum of the black body radiation of the cosmic microwave background and found fluctuations predicted by Sunyaev, Zeldovich and Peebles. Had there been no seed lumps in the beginning, there would be no fluctuations to see now. Calculated results on how these fluctuations would have grown since the Big Bang fit measurements. Now we have powerful computers to solve the equations governing cosmological processes and simulate the universe's evolution. We can watch filaments form and collapse, and predict the formation of stars, galaxies and X-ray clusters, as shown by Dr. Ostriker's work in 1996. Dr. Ostriker showed simulations of matter distribution within very large volumes, building a "cosmic web". Galaxies form at the intersections of the cosmic web. Starting from filaments, we could simulate stellar lumps forming and watch them merge. Dr. Ostriker showed such a simulation of the evolution of a galaxy, the result looking very much like regular elliptical galaxies. After 1975 we had a model with the dark matter and the developmental structure, but quantitatively it didn't quite work. The age of the Universe calculated with our knowledge up to that point was smaller than the age of the stars within. Also, observations on some distant supernovae showed that the Universe is accelerating. To fit the fluctuation evolution from the more detailed CBR data from the WMAP satellite measurements in 2008 required a non-zero cosmological constant and Omega totalling up to 1. All of these led to the proposal of dark energy, which joined our inventory of the universe to finally get all the ingredients to balance. With the impressive amount of the Sloan Digital Sky Survey data, we obtained a range for how much dark matter is in the universe, further narrowing the range set by the WMAP data. 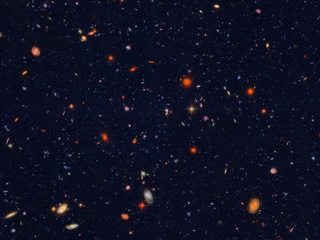 By 2013, only one possible model seems to fit: No curvature, certain levels of mass and dark energy. The total Omega is 0.994 plus/minus 0.008. The values for the dark matter, ordinary baryons, the dark energy component and the Hubble Constant have similar small uncertainty ranges. The lifetime of the universe is 13.76 billion years, give or take 60 million. This is a very definite model with narrow uncertainties that fits most observations. But some big questions are completely unanswered. What produced the initial perturbations? What was before the Big Bang? What are dark matter and dark energy? What's going to happen next? Do we matter? Does the anthropic principle make sense? So we still have questions, and the rest, Dr. Ostriker said, is silence. The president then invited questions. One question was about whether the statements about an accelerating universe and the fact that stars further away move faster were inconsistent. Dr. Ostriker replied that while the universe had indeed been slowing down, in the last billion years, this has turned to acceleration instead. Another question was if there was any equivalence or conversions between dark matter and energy. Dr. Ostriker responded that there have been attempts to make a model to unify the two, where predicting one predicts the other, but no satisfactory model has emerged yet. Afterwards Mr. President thanked the speaker, made the usual housekeeping announcements and invited guests to join the Society. At 10:12 PM, President Millstein adjourned the 2330th meeting to the social hour.